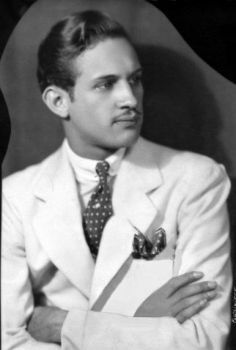 Leonard Reed, noted dancer and entertainment businessman, co-created the famous Shim Sham Shimmy tap routine that has been replicated for centuries by tappers the world over. He was also associated with Joe Louis (1914-1981) during the heavyweight boxer’s efforts to break down golf’s color barrier. Reed was born in Lightning Creek near Nowata, Indian Territory, on January 7, 1907, to a woman who was half African American and half Native American (Choctaw and Cherokee). Reed was orphaned at the age of two when his mother died of pneumonia and was raised by a series of relatives, foster parents and guardians in Kansas City, Missouri. As a teenager, Reed began performing the Charleston dance at carnivals in the Kansas City area. His high school principal helped him gain entrance into Cornell University, but Reed dropped out to become a professional dancer. The blue-eyed Reed and another light-skinned African American named Willie Bryant (1908-1964) developed a successful vaudeville act, “Brains as Well as Feet,” passing as Caucasians so they could perform for all-white audiences. Together, they closed their acts with the Shim Sham Shimmy, a 32-bar tap routine. In the early 1930s, Reed and Bryant were barred from white clubs when their African American ancestry became common knowledge. Soon thereafter the duo broke up, and Reed began producing shows for black performers at famous venues like the Cotton Club and the Apollo Theater. In the late 1940s, Reed became the private secretary of heavyweight boxer Joe Louis. Both men won several tournaments on the United Golf Association circuit, an all-black organization that staged professional contests when African Americans were barred from the Professional Golfers’ Association of America (PGA). Louis helped force the PGA to abandon the “Caucasians Only” clause in its charter in 1961, but under a sponsor’s exemption he was able to gain entry into a few earlier PGA events, accompanied by Reed. Reed is often credited with being the first black player to have taken part in a PGA tournament when, in the mid 1940s, he was given a tour card by an official who thought Reed was white. For the last several years of his life, Reed taught dance and pursued various musical interests at his studio in Los Angeles. In 2000, he received a lifetime achievement award from the American Music Awards and two years later received an honorary Doctor of Performing Arts degree from Oklahoma City University. He died at the age of 97 in Covina, California of heart failure on April 5, 2004, and is buried in Los Angeles. He was married for 52 years and had a daughter, granddaughter and two great-grandchildren. Rusty Frank, TAP! The Greatest Tap Dance Stars and Their Stories 1900-1955 (New York: W. Morrow, 1990); Frank Cullen, Florence Hackman and Donald McNeilly, Vaudeville, Old and New: An Encyclopedia of Variety Performers in America (New York: Routledge, 2007); "Tap Dance Pioneer, Producer,” Los Angeles Times (April 9, 2004); Danny Walker, “World Renowned Nowata Dancer’s Life Left Huge Legacy,” Nowata Star (April 21, 2004).